Have you ever thought about how that double play gets blasted to MLB headquarters in NYC, edited and buzzed back for instant replay on your TV and mobile device? MLB has worked for years to perfect the art of getting clips, highlights and real-time game footage up in a matter of minutes so fans can partake in a social TV experience and enjoy watching games on multiple devices. But how do they do it so quickly? Through the magic of cloud collaboration. 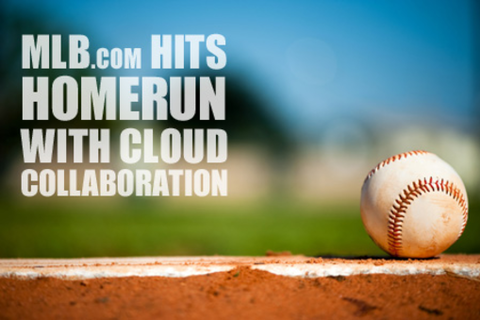 Staying on task could be frustrating using verbal communication and saving spreadsheets to network drives, but MLB.com tapped a cloud-based collaboration platform to automate processes and significantly reduce workload for communication and collaboration. The platform has allowed MLB.com to alleviate email inboxes and reduce bandwidth constraints, disparate files and broken conversations – which typically hinder the natural project collaboration and teamwork processes – and cut the publishing time from 20 minutes to just five minutes. As co-founder and CEO of Central Desktop, Isaac oversees business strategy and sales for the company. Isaac has a proven record in both early-stage technology companies and enterprise sales and marketing. As a founding partner at Upgradebase, Isaac served as vice president of sales and marketing where he oversaw all business development and sales for the company. During his three-year tenure at CNET, Isaac served as a director of North America enterprise sales for CNET Channel. As director, he was responsible for the acquisition, sales and management of global partnerships with Microsoft, Google, eBay, Yahoo and Best Buy. Isaac led and managed CNET's global partnership with Microsoft to launch the Windows Marketplace campaign in 14 countries, Microsoft's largest sales and marketing campaign at the time. Isaac received a bachelor's in English from Ambassador University and attended the University of Northern Colorado Graduate School where he earned a master's degree in English literature. Rob is entering his eighth season at MLB Advanced Media(MLBAM). He currently serves as manager of Multimedia Publishing, overseeing the processing and placement of all video content on MLB.com and 30 club sites. In addition to this title, Rob also has become a Collaboration Specialist at MLBAM. He works with all groups in Multimedia, finding ways to streamline and improve communication, optimize email usage and create simple access to important information. Prior to his time in Publishing, Rob was MLBAM's video liaison for YESNETWORK.com and SNY.tv. During his time in that role Rob received an Emmy for his work on YESNETWORK.com's web-only postgame show, "Post Game Plus".